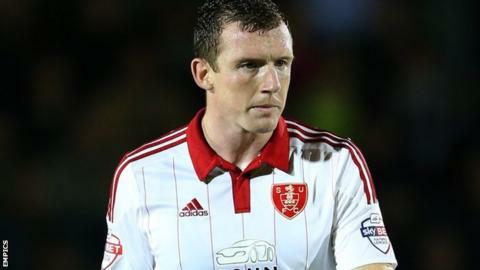 Neill Collins scored in his 200th appearance to help Sheffield United salvage a draw against Southend United. Ryan Leonard's deflected volley from the edge of the box and Jack Payne's low strike gave Southend an early lead. Jose Baxter's tap-in from close range boosted the Blades, before Collins struck just before half-time to draw the scores level. Billy Sharp and Chris Basham both hit the woodwork after the break as Southend hung on to secure a point. Match ends, Sheffield United 2, Southend United 2. Second Half ends, Sheffield United 2, Southend United 2. Myles Weston (Southend United) is shown the yellow card for a bad foul. Attempt saved. Jose Baxter (Sheffield United) right footed shot from outside the box is saved in the top centre of the goal. Attempt missed. David Worrall (Southend United) right footed shot from outside the box misses to the left. Myles Weston (Southend United) wins a free kick in the defensive half. Billy Sharp (Sheffield United) hits the right post with a right footed shot from outside the box. Substitution, Sheffield United. James Wallace replaces Paul Coutts. Attempt missed. David Worrall (Southend United) right footed shot from the centre of the box is just a bit too high. Corner, Sheffield United. Conceded by Daniel Bentley. Corner, Sheffield United. Conceded by John White. Attempt missed. Myles Weston (Southend United) header from the centre of the box is close, but misses to the right. Attempt missed. Chris Basham (Sheffield United) header from the centre of the box is close, but misses to the right. Jamal Campbell-Ryce (Sheffield United) wins a free kick on the left wing. Jose Baxter (Sheffield United) hits the left post with a right footed shot from outside the box. Attempt saved. Billy Sharp (Sheffield United) right footed shot from the centre of the box is saved in the top left corner. Substitution, Southend United. Myles Weston replaces Kevan Hurst. Attempt missed. David Worrall (Southend United) header from the centre of the box misses to the right. Corner, Southend United. Conceded by Robert Harris. Corner, Southend United. Conceded by Chris Basham. Corner, Southend United. Conceded by Kieron Freeman. Attempt saved. Kevan Hurst (Southend United) left footed shot from outside the box is saved in the top centre of the goal. Attempt blocked. Dean Hammond (Sheffield United) right footed shot from outside the box is blocked. Second Half begins Sheffield United 2, Southend United 2.